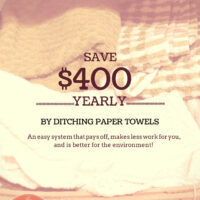 Want to save money, eat less fast food and feel better about your living space? There is one secret answer to all of these wishes: it starts with a clean kitchen. Whether your kitchen is spacious and huge or teensy tiny, keeping it clean and organized makes a huge difference. 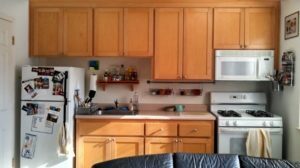 Clean tiny kitchens feel bigger and organized larger kitchens are more useful (because items don’t fall in the back and get lost in the clutter). A cluttered, messy kitchen isn’t welcoming at all. None of us like to scrape goo off dishes or wash BEFORE we cook. When your kitchen’s a disaster zone it’s easy to throw in the towel and order out. After all, does anyone really want to work in a chaotic mess? Could you even FIND the right food and tools if you wanted to cook a meal? Ready to take your kitchen from a crazy hot mess to organized, a space you love to live in? Organizing advice often entails expense. We’ve all looked through those home decorating magazines and laughed at the prospect of a “$5000 budget kitchen makeover.” Now, don’t get me wrong. I know overhauling and redecorating a kitchen is astronomically costly. We’re talking thousands and thousands of dollars for a total redo. But even a beautifully decorated designer kitchen is still an unmotivating mess if you don’t learn and implement basic organizational skills. You don’t need to spend a lot of money to take back control of your kitchen. You may even get by with items you already own. The key to a great kitchen is knowing how to keep it clean. You need to keep cooking tools readily accessible. The counters should be clear. The sink free of dishes. You should know what ingredients are on hand simply by glancing at your clean cupboards. Sound like an impossible dream? It’s not! I’ll tell you how to get there (on a budget). 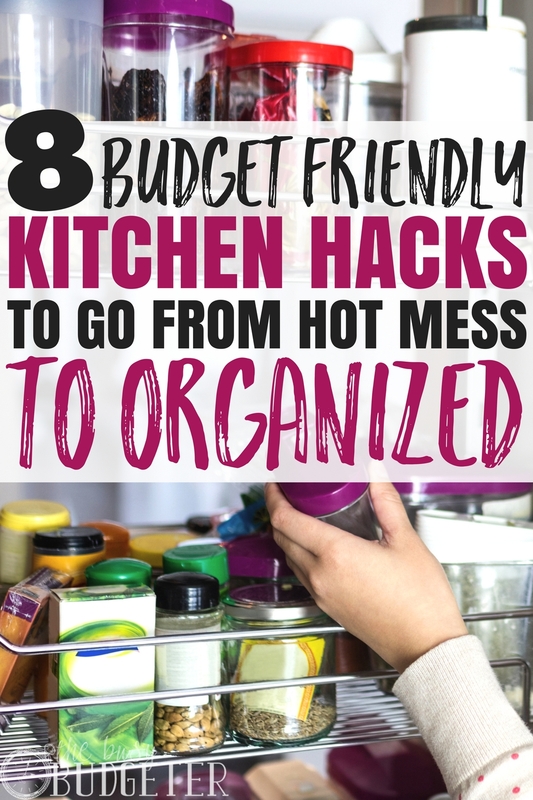 Here are 12 budget-friendly hacks to take your kitchen from a hot mess to organized. All of us have vertical space in our kitchen. Whether it’s the “dead zone” above your fridge, the extra space in the top of cabinets or the space above your cupboards. Rarely do we end up using this space (or we shove something “decorative” up there like baskets to collect dust). If you need more storage in your kitchen, consider ways to maximize your vertical space. Install extra shelves in your cupboards. Put a sliding tray in the top cupboards, and remove the entire tray to view what’s available. Use wire baskets or shelving in the tops of cupboards to create storage in this rarely used area. Popular blog the kitchn shows a great example of this technique in an ultra small kitchen. Office-type baskets and unconventional storage containers offer great, budget friendly solutions. Install a curtain rod under the cupboards to hold baskets for a stylish supply solution. Magazine organizers—the metal, plastic or wooden type, are great organizers for the kitchen! 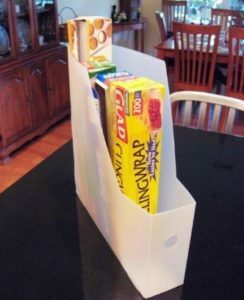 Store your plastic wrap, tinfoil and other items in these holders for an easy way to keep them under control and change your kitchen from a hot mess to organized. Check out these paper organizer ideas from Chica and Jo for this idea and all sorts of brilliant way to wrangle your kitchen tools. Store Tupperware lids, cutting boards and even small jars or cans. If you use metal magazine holders, affix them to the inside of your cupboards to use your empty space. The magazine holders are found at IKEA, the dollar store and most discount stores like Wal-Mart. Reuse jars to hold kitchen supplies. Repurpose containers and baskets to store towels, hot pads and other kitchen tools. Just because a storage container wasn’t designed FOR the kitchen, doesn’t mean you can’t use it there! Sometimes you should get creative, but sometimes you find exactly the right solution for a job. 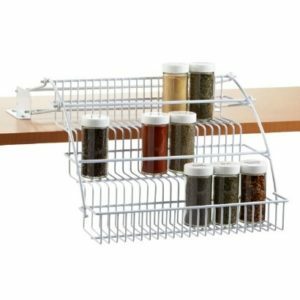 I picked up this drop-down spice rack from the Container Store and it’s perfect! It also works great for medication and vitamins. It creates accessible storage for the small items which often get lost in the shuffle. Spices don’t have a very long shelf life. In fact, most of them expire pretty fast. You don’t need to store tons and tons of spices. 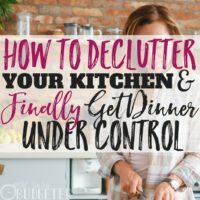 If you are storing them, it’s probably time to clean out your cupboards and give your kitchen an organizational overhaul. It’s much easier to organize ANY area when you have less to deal with. One of the biggest keys to organizing your kitchen on a budget is to find working solutions. Sometimes it means “rigging” tools and repurposing items. Other times it means buying the right tool for the job. In this case, the spice rack was worth it. Small changes change your kitchen from hot mess to organized. Country Living offers all sorts of great ideas for using a lazy Susan (not just the kitchen). Lazy Susans are spinning trays allowing you to access items in the back of your cupboards—you know the ones that fall behind and get lost? The greatest aspect of a lazy Susan is they’re cheap, cheap, cheap. You can find them at Wal-Mart, Target, the dollar store and organizing stores. Once you use them, you’ll be amazed at how much easier it is to reach the stuff in the back. You’ll easily check expiration dates and see what you have right away. Plus, they really maximize corner spots. Use clear bins or other containers to wrangle small items on top shelves. Choose containers that allow you to see what you have easily. Regularly sort through the bins, lazy Susans and containers, especially for items like vitamins which can expire quickly. If you want to maximize your kitchen organization, pick up a cue from grocery and department stores. Learn to rotate and “face” your stock. This means new items go to the back and older items move up front. When you come home from grocery shopping, take a few extra minutes to unload items and ensure they’re stored and used properly. Check expiration dates on anything that seems questionable and move it forward (especially if the date’s getting close). 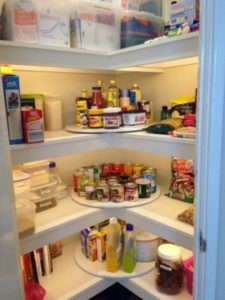 There are cupboard organizers specially created to help you rotate your stock of canned goods, but check out this tip from Then She Made. 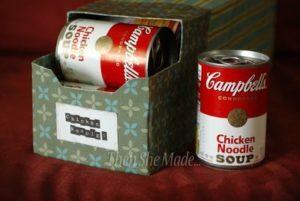 She created these can organizers out of old soda boxes! Genius! Covered in paper, they look absolutely fantastic and as good as what you’d buy in the store. Quick, easy and cheap way to bring your kitchen from hot mess to organized. When I first started cooking freezer meals, I couldn’t believe what a game changer it was. I was able to cook once and eat for weeks! Freezer meals were cheap and delicious! I saved money AND we had delicious dinners! Ah-Mazing! It became quickly obvious I was going to need a bigger freezer if I was going to keep up with the freezer meal planning. I scoured Craigslist for a chest freezer and had a tragic near miss with a $150 bargain chest freezer. Well, everything happens for a reason, because when I went to Lowe’s to see if I could find a freezer option, I found one for $135 (with a coupon)! Score! 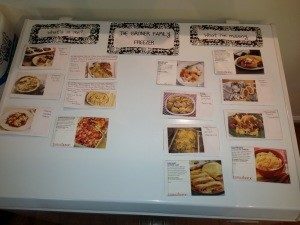 Even more exciting, I realized my freezer was a giant magnetic whiteboard and I could plot out my meal plans right ON my freezer! Now I use MyFreezEasy to prepare ten delicious freezer meals in an hour and store them in my chest freezer. Freezer cooking is an awesome way to save a ton on grocery expenses and get OUT of the kitchen. Your kitchen will stay much cleaner and more organized because you won’t need to mess it up by cooking on weeknights. I highly recommend freezer cooking, it is the number one way to save on groceries and food. 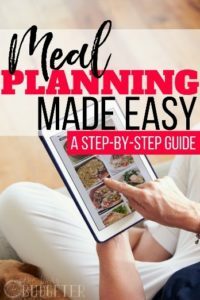 Whether you opt for MyFreezEasy or another meal planning method, one thing’s for certain—meal planning will help you keep your kitchen cleaner and more organized. You’ll waste fewer ingredients. You’ll spend less on random items that spoil in the fridge or go bad in the pantry. Planning makes all the difference. A bonus of meal planning is the ability to cook ahead. I typically do my cooking on the weekends. A few weekends a month (1 or 2) my husband takes the kids and I cook for about an hour. That’s it. Occasionally he’s my sous chef and we’ll have a friend watch the kids, in which case we cut our cooking time in half. When we’re finished, all we need to do on weekdays is pop a meal in the oven or crockpot. Our kitchen stays clean and organized. We simply wash a few plates and there’s hardly any clean up to do. Meal planning and cooking ahead is the key to transitioning your kitchen from hot mess to organized. The true secret of keeping your kitchen clean and organized doesn’t require any special items or purchases. If you want a kitchen that’s clean, easy to work with and beautiful keep up on your dishes. 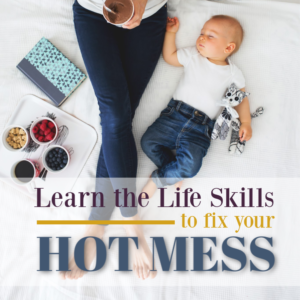 I’m telling you guys, it’s the most important step to moving away from hot mess. Commit to washing your dishes each and every time you eat. Never leave a dirty dish in the sink. I’ve created a step-by-step system to help you keep up on your dishes. Follow the plan and you’ll see a transformation in your kitchen. Suddenly it will become usable and relaxing, I promise. Commit to implementing the system for 28 days until it becomes a regular habit. At first, keeping up with dishes seems daunting. You know why? Because if you have a sink full of crusty dishes it’s hard to keep up. Plus, new dishes stack up each day. It feels endless. 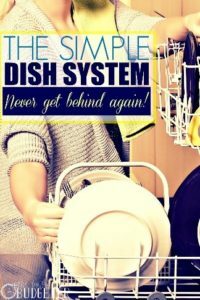 But if you implement a system and start a regular habit of washing dishes it gets easier. Plus, cooking meals ahead greatly reduces the number of pots and pans you’ll need to deal with. Once you start focusing on it, there are tons of ways to bring your kitchen from a hot mess to organized and more efficient. Which ends up saving you money because then meal planning is easier, cooking is easier, and you eat-in more and waste less. Did I miss any? 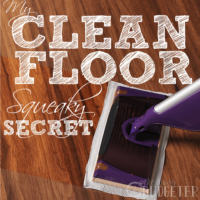 Do you have any favorite budget-friendly kitchen hacks I should know about? Nice post, I’ve become an expert at organizers and racks over the years. I’ve fit them in everywhere and they can really help hide things away. Now I don’t feel so weird. All my friends think I’m a little nutty for being so organized. I think it makes sense, and it is a time-saver. Not to mention money saver too. It really isn’t that hard, but when you let things get out of hand , it does feel insurmountable. Our home is very small so we’ve had to be really creative to find ways to keep all of our stuff organized. We’re a family of 4 living in a 2 bedroom apartment. It’s not easy to be organized when there isn’t a lot of storage space. But with few creative solutions like you presented, a lot is possible! 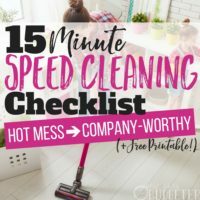 These are great tips! I am always looking for more space in my kitchen! Thanks! Great post, You provide such useful guide to make a kitchen look more stylish without spending too much money. I thought furniture is one the important points in the interior of the kitchen. You have to check online before buying your kitchen future so you get the best discount on your kitchen furniture. Great hacks! I am currently using a lazy susan in my pantry closet and I use an over the door shoe rack for all my little things and snacks and it actually works out! I also started to put away my toaster after each use since I don’t use it often and it just takes up space. The one thing I do make sure I always do is the dishes! My husband has a thing about dishes so he washes as he cooks and now I have that habit as well, it keeps dishes from piling up and it actually makes sense. For instance, we plate our food and then while one of us sets the table and brings the finished food to it, the other one is washing the pan we used (as long as it isn’t too messy if it is we just put water in it and let it soak until after). After dinner, we wash our plates. I have a real hard time keeping up on dishes because we don’t have a dishwasher. I think I am going to try and implement your idea to keep up on them after every meal because I think this will help my stress level. Thanks! Thanq so much.very useful article…. All my friends think I’m a little nutty for being so organized. I think it makes sense, and it is a time-saver. I love posts like this. I love realizing how small changes can make a huge difference! I have a small kitchen and if I’m not careful with not putting down random stuff on the counter it explodes. So we installed a small wall unit where we sort all paper coming into the house so that we don’t end up having piles of junkmail, magazines and bills all over the kitchen counter. Also, when your kitchen is small, having dirty dishes on the counter or in the sink makes the whole kitchen look messy. So developing a sustainable rutine for keeping up with the dishes made a world of a difference as well. Thanks for sharing this post and thanks for great content. I love my drop-down spice rack! It is so much easier to see the labels when they are stacked on different levels! Look for a place open to the public. Many commercial kitchen equipment suppliers don’t sell to the public, so make sure before you go. These are really helpful tips. I have a small apartment kitchen and no space for a deep freezer, but I found on occasions when preparing and freezing meals, I can make space of a small kitchen freezer by reusing tortilla bread bags for some food and reusable containers (as long as the contents are cold). It helps me reduce plastic waste. The dish washing post was also helpful, it’s not always easy without a dishwasher, but makes sense and is doable. Nice school. I hope you’ll learn a lot in there. I like having good food. Hey thanks for sharing the products, my wife will be happy to see the surprises I will definitely bring for her.